Shamanic practice is as ancient as humanity. It is all about generating and maintaining an atmosphere of healing, clearing and spiritual guidance. My shamanic teaching is spiritual and practical, without any religious preference. The root of the very word healing comes from whole - and in my view, shamanic practice is about becoming whole, also to fill the hole(s) perceiving the world as a whole. Shamanic ceremonies, rituals and prayer, many symbols - and in general, whatwever you are confronting in your life - are conceived as Medicine. To me, healing is mostly about Trauma - wounds of shock which we experience during our childhood, in war or other turmoils of live. Shamanic rituals and ceremonies use different techniques to help us opening our senses and become receptive to blocked emotions and hidden memories. This process is unobtrusive and often releases suppressed emotions and old tensions on a deep level of the unconcious, opening channels of understanding and compassion to our old reactions. The results range from feelings of relief and easiness to profound changes in behavior and attitude to life. As a shaman, my inner drive is to support myself and others to reconnect to our own inner source - to become whole and powerful. 20 years ago I met Frank Natale. Frank was a pioneer in the field of personal growth and self-awareness seminars and helped in many ways to take the shamanic / spiritual aproach back into our western culture. In his seminars and trainings I reconnected to many of my long forgotten childhood memories, traumatic experiences and even past life experiences. My connection to nature and spirit was reactivated and I got inspired to share this new/old knowledge and the techniques I learned. I offer trancedance, shamanic journeys, meditations and various other techniques and practices for spiritual growth and self healing, on my own as well as with various partners. Since I'm a musician, I always use live music for most of the events to support the quality of "being in the moment", in the "Here and Now". Besides - the quality of live music, played on real instruments in real time helps people to step much easier into the "otherworld". TranceDance is one of the oldest ways of reconnecting with our inner forces - empowering, uplifting, energizing, motivating. A great way to step out of old habits and to look at your life in a different way. The shamanic journey is in some ways very similar to a TranceDance experience. You go on an inner journey to find answers, healing, clarity, guidance - only this time you lay down on your back, in a safe, cosy environment, and you use the sound of the shaman's drum to travel inside or outside yourself. The drum is your vehicle to go on a journey. Again we use the blindfold, the breath of fire and the intention and search for our answers. Often we do this in a group, but I also offer these journeys for individuals, specially for delicate issues. The Talking Stick ceremony supports every participant to be honest and sincere to the moment of truth in him/herself and the others. The Trance Drumming is a sharing ceremony, all participants playing drums together in a circle. It is a non competitive way to share music and become one with sound, beat, drums and one another. Usually carried out around the fireplace, we step into a different space, often switching easily into a trance state. 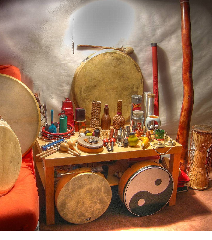 The sound of the drums supports a relaxing, soft, yet energized field where thoughts are gone and we can feel the sound with our whole bodies, getting massaged by the sounds and rhythm, become one with all around us. One of the most simple and powerful ways of trauma healing I came across. Soulhunting is based on the understanding, that at any time a shock occurs in our life - may it be physical, mental or spiritual - that very part of our soul that is involved, diappears, hides, crumbles, because it is Incapable to deal with the pain. To become whole again, we have to invite these parts back into our life, into our being (or someone has to do it for you). The scared hidden part(s) of the soul often appear as "hurt little children" that need to be invited, seduced, allured - to be convinced that they are save now and that we can care about them. We invoke the sound of the double drum to send you on the inner journey, lying down on the back, searching and inviting the missing soul parts. This is, in short, the process to begin with. This ceremony can be shared with many others, or done in an individual session. "The ceremonial tobacco is usually very strong, the tobacco used in North America is nicotiana rustica, and usually the smoke is not inhaled, but puffed into, then out of the mouth in each of the four directions, acknowledging Father Sky, Mother Earth, and the Great Spirit as the pipe is smoked and passed from one person to the next around the circle." Elders, healers, and teachers of the ancient Earth Wisdom traditions align themselves with natural forces to cultivate a balanced attitude and relationship with the environment. The Four Elements Medicine Wheel Prayer addresses and invokes the spirits of earth, fire, water, and air as well as the powers of the four directions (or six, including above and below). Each of the elements as well as each species of animal and plant, constitute the domain of beings with whom it is possible to communicate and attune oneself. You can here integrate the symbolism of the four directions to walk in balance and gratitude on the Earth with this prayer during the Thanksgiving season. This prayer can integrate for you the symbolism of the four directions of objective space (north, south, east, and west) and the powers of the four elements, the inner and outer, the physical, and the psychic and spiritual. Turn toward each of the four directions as the prayer is said, going around clockwise starting with the east; alternatively, one could turn one’s back receptively toward the direction. great nuclear fire of the Sun. and all living beings upon it. the noble trees and grasses. deepest matrix, womb of all life. to cleanse and to heal. Great blissful darkness of peace. your living breath animates all life. and bring challenge and change. The ecstasy of movement and the dance.